Send superheroes on a mission to save some candy by hanging up this action-packed Justice League Pull String Pinata. 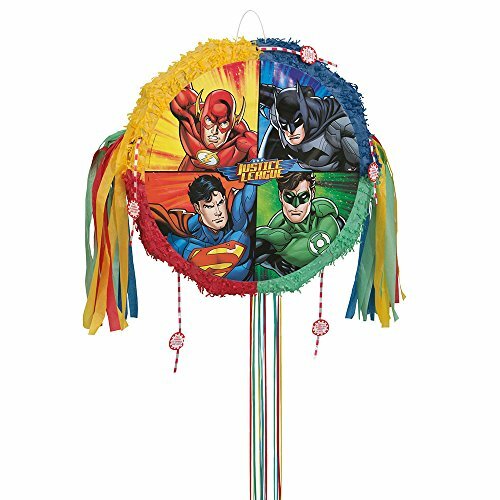 Featuring all of kids’ favorite DC heroes, including Superman, Batman, the Flash, and the Green Lantern, this drum-shaped pinata is sure to add some extra “POW!” to any boy’s Justice League birthday party or superhero party. It can be filled with up to 2 pounds of sweets and superhero party favors and easily hung using the plastic loop attached to the top. Don’t worry about little crime-fighters accidentally getting injured during the action — all it takes is a firm tug on the correct hanging string to release the goodies stored inside. No hitting or whacking required! Best of all, since this pull pinata won’t get demolished during the superhero skirmish, the guest of honor will be able to save it as a super cool decoration to display in their secret lair after the celebration.